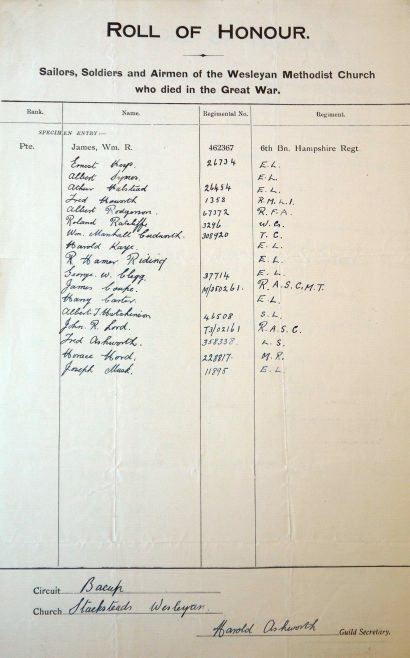 This list is of the members of the chapel who died in the First World War. The majority served in the local regiment. [Pte] Ernest Keys 26734 5th Bn. East Lancashire Regt. [Pte] Albert Symes  7th Bn. East Lancashire Regt. [Pte] Arthur Halstead 26454 1st Bn. East Lancashire Regt. [Pte] Harold Kay  1/5th Bn. East Lancashire Regt. [Pte] R. Hamer Riding  8th Bn. East Lancashire Regt. [Pte] George W. Clegg 37714 2nd Bn. East Lancashire Regt. [Pte] Harry Carter  11th Bn. East Lancashire Regt. [Pte] Albert J. Hutchinson 46508 2nd Bn. South Lancashire Regt. [L/Cpl] Fred Ashworth 358338 1/10th Bn. King’s (Liverpool) Regt. [Rifleman] Horace Hord 228817 1st Bn. Monmouthshire Regt. [L/Cpl] Joseph Musk 11895 6th Bn. East Lancashire Regt.